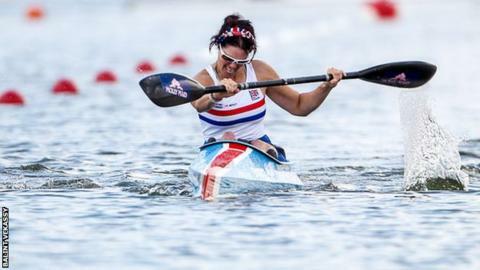 Jeanette Chippington won Great Britain's second gold medal at the Canoe Sprint World Championships with victory in the Para-canoe KL1 200m final. The former Paralympic gold-medallist swimmer also claimed another place for GB Para-canoe at next year's Rio Games. Likewise, Rob Oliver sealed a Rio spot for Britain in the KL3 class with a silver in his final in Milan. GB disability athletes have now booked four places in Brazil next September. The victory for Chippington was her ninth Para-canoe world title since she switched to the sport from swimming. Starting in Seoul in 1988, the athlete, who suffers from a condition affecting the spinal cord, competed in five consecutive Paralympic Games as a swimmer, winning two golds in Atlanta in 1996. "This has been the toughest of them all with a lot of pressure in the lead up to it," Chippington told BBC Sport. "Getting the boat place for Rio is another weight off my mind and I'm pretty proud of myself to have qualified the boat."